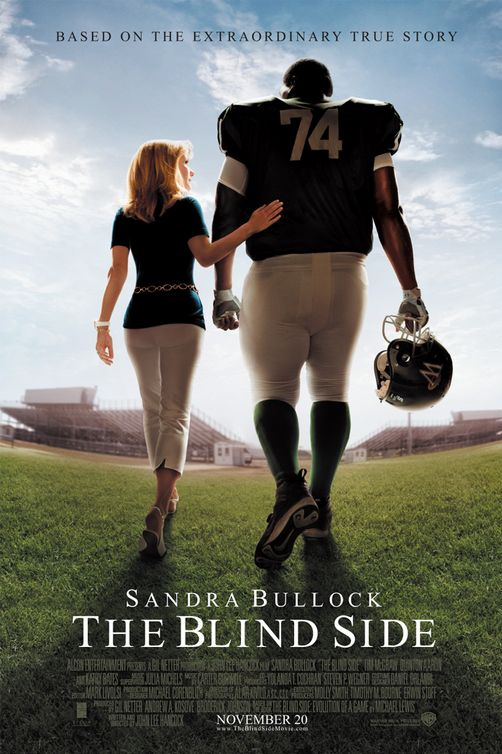 The Blind Side (2009) | Tales From The Ipe! On a Saturday night without the kids, we went to see a late showing of The Blind Side, a 2009 film starring Sandra Bullock. We attempted to see it back in mid-February on Presidents’ Day, but there were no seats. My wife later went to see it a week later with friends, and enjoyed it. I hadn’t seen it yet, and she wanted to see it again. Of course, this time around on a Saturday night, the theater was nearly deserted. I suppose a lot of people in February wanted to see it when we wanted to see it. I knew very little about the movie, as opposed to most other films I’m interested in. I’m usually watching the trailers, reading reviews, and sometimes even checking out the plot synopsis (up to a point.) If you were unaware, it’s a film based on a book, about the story of a family in Memphis who take in a down-on-his-luck and impoverished teenager named Michael Oher, get him back on his feet, and he ends up becoming a star football player, and who later gets drafted by the NFL’s Baltimore Ravens. This entry was posted in Entertainment and tagged movies, quinton aaron, sandra bullock. Bookmark the permalink.